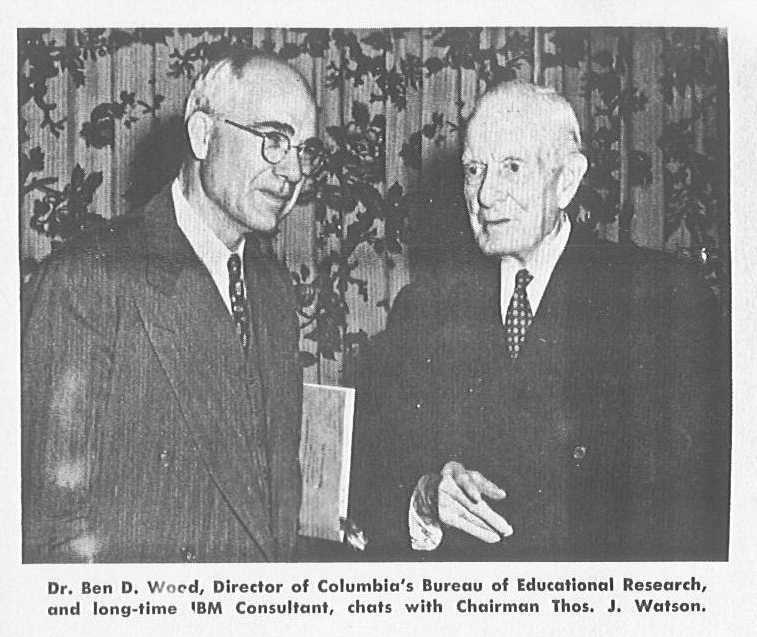 Columbia University Professor Benjamin D. Wood and IBM President Thomas J. Watson at the NORC dedication, Columbia University, 2 December 1954. Photo: IBM Business Machines , 23 December 1954 , courtesy Herb Grosch. Ben Wood came to Columbia as an instructor in education in 1921, and was a professor from 1924 until he retired in 1962. By the late 1920s, Wood was head of Columbia's Bureau of Collegiate Educational Research, and was interested in automation of test scoring. He wrote to a number of office-machine companies about the problem but struck a responsive chord only at IBM, where he had an unheard-of day-long interview with company president Thomas J. Watson (pictured above many years later), who promptly gave him several truckloads of punched-card equipment, with which Wood established Columbia's first mechanized computing laboratory, the Columbia University Statistical Bureau, in 1929, Wallace Eckert's first exposure to punched-card equipment. 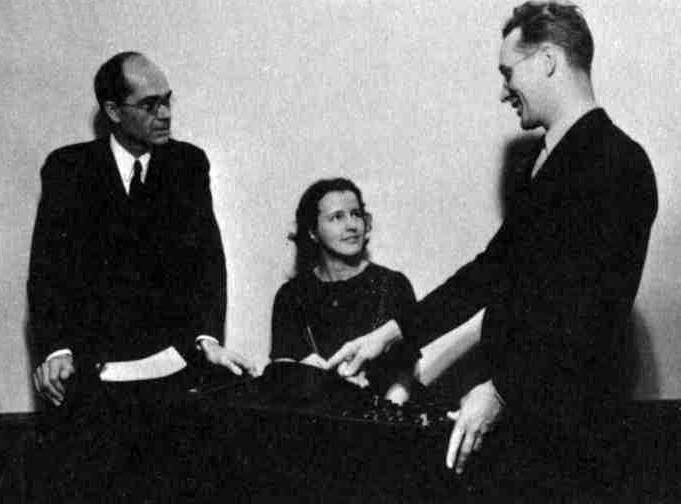 Wood is shown above (left) with Reynold B. Johnson (right), hired by IBM at Wood's behest to engineer the 805, which was announced in 1937. Bashe, Charles J.; Lyle R. Johnson; John H. Palmer; Emerson W. Pugh, IBM's Early Computers , MIT Press (1985) . Brennan, Jean Ford, The IBM Watson Laboratory at Columbia University: A History , IBM, Armonk NY (1971) . Eames, Charles and Ray, A Computer Perspective: Background to the Computer Age , Harvard University Press. First Edition 1973; Second Edition 1990 . Pugh, Emerson W., Building IBM: Shaping an Industry and its Technology , The MIT Press (1995) . Wood, Ben D., "Analysis of College Test Results", in Baehne, George W., Practical Applications of the Punched Card Method in Colleges and Universities , Columbia University Press (1935) . IBM, Educational Research Forum Proceedings , Endicott NY, August 25-29, 1947 (contains numerous articles on test scoring, surveys, and educational measurement, as well as uses of automation in school administration). Educational Testing Service. Wood became president of ETS when he retired from Columbia in 1962; today its main building is the Ben Wood Building.